When talking to business owners and organizational leaders about SEO many don't know the difference between Local SEO vs Organic SEO, which is why one of the first questions we ask is “What do you think SEO is?” While most people have a general understanding these days the responses we get are all over the map. Some people think SEO is an all-encompassing term for online marketing, while others confuse it with Social Media Marketing and still others just say, “I have no idea that’s why I am talking to you”. With this in mind, I thought it would be beneficial to outline one particular area of SEO, which is Local SEO vs Organic SEO. Considering the fact that often times even knowing what SEO actually is can be difficult for those without much experience, getting into the minutia of different types of SEO can be particularly confusing for people, but here it goes. Loosely defined, Local SEO is a type of SEO that has some sort of geographical element to the strategy. For instance, if you own an electrical company, you probably have limits to your service area. These are the types of people that are generally good candidates for a Local SEO campaign. If you are searching for “Electrician San Diego” you are performing a local search and search marketing and advertising agencies like us are working to ensure that their clients show up in those searches. Local SEO is generally a combination of focusing on optimizing a Google My Business profile or profiles and also working on organic listings as well. The basic idea when implementing a search marketing campaign is to get as many page placements as possible and with a Local SEO campaign, there are 3 page placements. Google Ads – While this is always changing, Google Ads are generally the top of page and bottom of page placements you see with the phrase “AD” next to it. Which I presume is legally required or else it wouldn’t exist. In addition to these traditional search ads, service-based businesses are also now running Google Home Service Ads, which is basically a Google Ad that says Google has done a background check on your team and gives preference to your ads as a result. Generally SEO and Online Advertising work together, which is why we almost always run a search advertising campaign in tendem with SEO efforts for more page placements. Google Maps – The 2nd-page placement on a local search query, is typically the Google Maps 3 pack. Gaining these placements is normally the result of a highly optimized Google My Business profile and some other off page SEO and on page SEO activities. 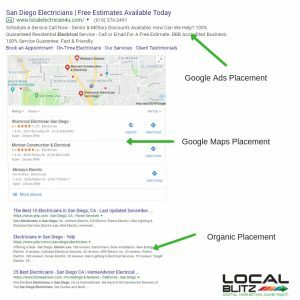 This placement is arguably the best “organic” placement available for a service based business and we see that this hold true with almost all of our clients as most of the leads and inquiries come via the Google Maps listing. Organic Listing – Just below the Google Maps listing comes the Google Organic listing, which are the links you are accustomed to seeing when searching on Google, generally with Meta Descriptions of what that web page is about. For many searches, these are still very valuable placements, that often get a lot of traffic, similar to the Google Maps listed previously mentioned. So what is Organic SEO? Most people focusing on just organic SEO are typically running a campaign that is not localized to very specific areas if at all. These could be SEO campaigns that are regional, national, or International. However, keep in mind, often times these national type campaigns may have a Local component to them if they have brick and mortar type businesses in different geographies. So hopefully you are not left more confused now! To keep it simple, if you serve a local market like San Diego, Indianapolis, or Seattle you are likely a candidate for the 3 Local SEO points made above. On the other hand, if you are not tied to a geography and serve a large region you may just simply focus on the organic listings. Long story short, SEO strategies have become increasingly complex over the years and ensuring that you have a good agency or consultant in your court will likely be beneficial for your efforts. Cough cough…Local Blitz. Hope this helps explain a sometimes complicated topic!! Should you find yourself still confused feel free to CONTACT US anytime!